MÖTLEY CRÜE and SIXX:A.M. bassist Nikki Sixx will step down as host of and end his nationally syndicated Premiere Networks/iHeartRadio rock radio programs "Sixx Sense With Nikki Sixx", "The Side Show Countdown With Nikki Sixx" and "The Side Show Classic With Nikki Sixx" at the end of this year. His final broadcast will be December 31, 2017. 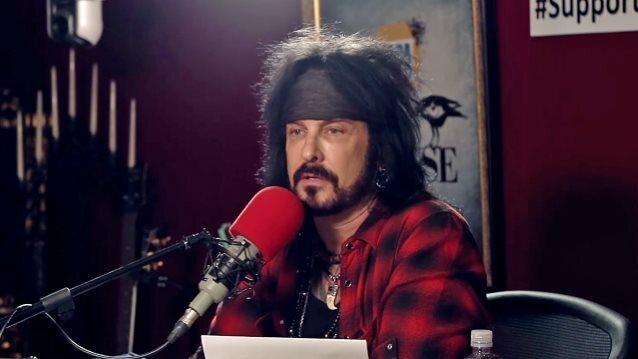 Launched at the beginning of 2010, his flagship radio program "Sixx Sense" quickly became the biggest syndicated rock show in America, distributed to more than a hundred and thirty stations nationwide and boasting nearly three million global weekly listeners. Sixx has welcomed an influential array of prominent musicians, celebrities, and noteworthy personalities as guests on the show. During his tenure as host he interviewed royalty such as Sir Paul McCartney, Slash, Steven Tyler, METALLICA, Stevie Nicks and Dolly Parton, boxing champion Mike Tyson, director Cameron Crowe, celebrity health expert Dr. Oz, and many more. In addition, the program provided a unique platform for new music discovery with Sixx hand-selecting up-and-coming talent and introducing his audience to future superstars. Sixx launched trailblazing artists such as AWOLNATION, GRETA VAN FLEET and NOTHING MORE, among many more, by debuting their music on "Sixx Sense". Featuring music from SIXX:A.M.'s "The Heroin Diaries Soundtrack", the first-ever soundtrack tied to a book release, Sixx has teamed up with former Live Nation chairman and "Spiderman: Turn Off The Dark Broadway" producer Michael Cohl to bring this compelling story of addiction and redemption to life on stage. Originally released in 2007, both the book and soundtrack will see tenth-anniversary editions released later this month: "The Heroin Diaries: A Year In The Life Of A Shattered Rockstar" featuring new chapters and never-before-seen photographs, is out October 24 via Gallery Books/Simon & Schuster. "The Heroin Diaries Soundtrack: 10th Anniversary Edition" by SIXX:A.M., featuring three newly reimagined 2017 tracks, including No. 1 hit "Life Is Beautiful 2017" is out October 27 via Eleven Seven Music. 2018 will also see Sixx take his first-ever photo exhibition "Conversations With Angels" around the world in partnership with Leica Camera. On display through November 5, 2017 at the Leica Gallery Los Angeles, the collection showcases the artist's talent for storytelling across platforms with intimate images by Sixx depicting homelessness and drug addiction amongst other subjects; topics that he was all too familiar with before photography helped change his life. Sixx has also partnered with Leica Camera on the debut of a limited-edition Nikki Sixx Leica Q camera. In addition to his own creative endeavors, the visionary artist remains committed to broadening horizons for all. Sixx recently penned a powerful op-ed for the Los Angeles Times arguing for better policies to end the scourge of opioid addiction in America. He has also joined Canadian talent show "The Launch" where he will mentor unsigned talent alongside Boy George, Shania Twain, Fergie, Alessia Cara, Julia Michaels and Jennifer Nettles as an experts in crafting a hit song on the new six-part series.